15 God also said to Moses, “Say to the Israelites, ‘The Lord,  the God of your fathers—the God of Abraham, the God of Isaac and the God of Jacob—has sent me to you.’ This is my name for ever, the name by which I am to be remembered from generation to generation. 18 “The elders of Israel will listen to you. Then you and the elders are to go to the king of Egypt and say to him, ‘The Lord, the God of the Hebrews, has met with us. Let us take a three-day journey into the desert to offer sacrifices to the Lord our God.’ 19 But I know that the king of Egypt will not let you go unless a mighty hand compels him. 20 So I will stretch out my hand and strike the Egyptians with all the wonders that I will perform among them. After that, he will let you go. Or, I will be what I will be. The Hebrew for Lord sounds like & may be derived from the Hebrew for, I am, in Exodus 3:14. Unspecified in Bible narrative. Daytime. The sun is behind the giant rock lettering. 01) (This page) Exodus 03 – Burning Bush – Scene 04 – I AM instructions (Rock version). 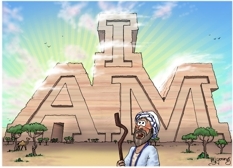 In which Moses is looking at gigantic carved “I AM” stone letters. 02) (Next page) Exodus 03 – Burning Bush – Scene 04 – I AM instructions (Fire version). 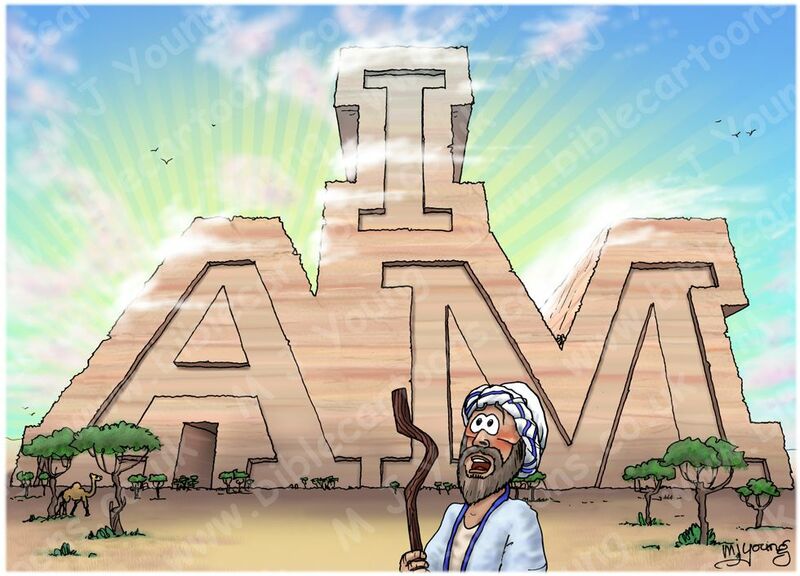 In this version I have Moses looking at large fiery “I AM” letters (in Hebrew). A lot has been written about the “I AM” statement of God in this passage of the Bible. In this first version of the scene I decided to illustrate the importance of it by having Moses look at gigantic carved rock lettering. I expect he is seeing these in a vision, rather than them suddenly appearing on the distant horizon, although anything is possible with the Lord! The trees in this scene are Umbrella Thorn Acacia (aka umbrella thorn, karamoja and Israeli babool, Acacia tortilis). A medium to large canopied tree native primarily to the savanna and Sahel of Africa (especially Sudan), but also occurring in the Middle East. In extremely arid conditions, it may occur as a small, wiry bush. It grows up to 69 ft (21 metres) high. It tolerates drought, wind, salinity and a wide range of soil types. The bark is grey to black in colour and has a rough texture. The tree has a combination of one straight, thin thorn with a small hooked thorn alongside, growing in pairs. The flowers form in clusters on old wood, and are creamy, white balls. The pods are a distinctive pale gold brown colour and are curled and twisted. The leaves are very small giving the umbrella a soft, feathery appearance. God’s choice to send a deliverer (Moses) to his suffering people is a testimony of His love and concern for the Hebrew people. God often seems to use human beings to bring about His desired results. The narrative of the Exodus reminds us of God’s willingness to work in and through human beings to alleviate our suffering. The Bible repeatedly emphasises that God hears our cry or groaning when we are oppressed (3:7,9; 22:22-23; Romans 8:23; James 5:4). The name of God is a single Hebrew word from the verb “to be” which is translated as “I AM WHO I AM” or “I WILL BE WHAT I WILL BE”. In Hebrew the word is composed of only four consonants, YHWH, because ancient Hebrew script did not contain vowels. Today no-one knows how this name would be properly pronounced. The Hebrews so revered the name of God that they never pronounced it for fear of mispronunciation. In their great reverence of this name they substituted another word (Hebrew em>’adonai) which is translated “Lord”, for this personal, covenant name of God. Today scholars believe that name was pronounced Yahweh. Many Bibles translate that name and write it all in capital letters: LORD. 01) God is declared to be a personal God. He is not an impersonal force, such as gravity. In biblical times the disclosure of one’s name was a very personal act, that told of one’s very nature. The implication in this passage is that God is revealing His love for the Hebrew people by initiating a personal, intimate relationship by disclosing His personal name to them. The Almighty Sovereign Creator has stooped to reveal His personal, intimate name to people whom He has chosen to be His people. 02) The personal name of God suggests that He is a living God, not a dead object or abstract idea. There is a mystery to “I AM WHO I AM”. This name suggests God is eternal, without beginning or end. God made it clear that He was the same person who had been with the Hebrew people from the call of Abraham. Originally God was to be worshipped wherever He appeared (See Genesis 12:7). In the wilderness wanderings, God led the Hebrew people to build a Tabernacle (tent of meeting) as their central place of worship (See Exodus 25:8). In the Promised Land the Hebrew people worshipped at a multiplicity og local sanctuaries (See 1 Samuel 7:15-17, 9:12; 10:3,,5,8,17). God eventually chose Jerusalem (Deuteronomy 12:5) as the proper place for worship and sacrifice (1 Kings 8). There David brought the ark (2 Samuel 6:12), and Solomon built the first temple (1 Kings 5:3-5; 6:38). Synagogue worship gradually developed during the Exile or later, through the people’s desire to worship even though the destruction of the Temple at Jerusalem and/or geographical isolation made traditional Temple worship impossible. In the synagogues prayers were offered as a substitute for sacrifices. But the synagogue was primarily a place of instruction rather than worship. The Jews had a passionate belief that the Jerusalem Temple was God’s only earthly habitation. This kept the synagogue in a subordinate position as long as the Temple stood. In the New Testament it was not considered important where a Christian worshipped, since they knew that the Lord Jesus was with them always and everywhere. Buildings are not inherently sacred or secular. All structures and places belong equally to God. Corporate worship was shared in homes, in the open country, wherever Christians met. The expectation of the Lord’s return discouraged the building of special places of worship. Some petition is inquiry. Moses’ inquiry led to the revelation of God’s self-identity in His self-existence. God takes the initiative in salvation. He gave His divine name to Mnoses at Sinai, along with His plan for deliverance. History can be deceiving. Present conditions may tend to hide God’s promises. God is always faithful to His promises, and that the proper time encourages His people with new promises. No matter how we suffer in the present moment, we can trust God’s promises to deliver and save His people at the right time.